The Gorkhas, last year, celebrated two hundred years of their existence in India. The world- renowned Gorkha Rifles or Gorkha Regiment completed 200 years of existence in April 2015. They became the backbone of the British Indian forces after having joined British service in 1815. Dehra Dun or the Doon valley, as it is popularly known, has several interesting landmarks of the eventful Anglo-Gorkha Battle(known as the battle of Nalapani or Khalanga) of 1814-15.The Khalanga Memorial was built by the British on the banks of the Rispana river,which flows below the Khalanga Hill, to commemorate their brave soldiers as well as the Gorkha gallants whom they defeated.The fort was made of wood, red sand and stones. The new memorial there commemorates the inspiring and indomitable courage of Balbhadra and his men. The Khalanga Memorial, a nationally protected monument looked after by the Archaeological Survey of India, is located on the road which takes tourists to the Sulphur Springs of Sahastradhara. It was in this Khalanga-Nalapani area of the valley that a fierce battle between the British and the Gorkhas was fought as both of them were eager to expand their territories. 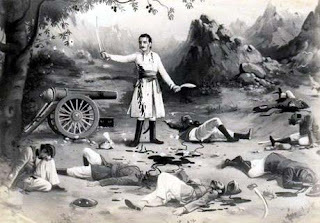 In 1804 the Doon valley came under the control of the Gorkhas.Raja Pradyuman Shah of Tehri was killed by them in the battle of Khurbura in Dehra Dun. Till the battle of Nalapani took place, the valley was under Gorkha rule. After the battle, the British Government reinstated Sudarshan Shah on the throne of a truncated part of Garhwal. On October 31, 1814 the third infantry division under Major General, Sir Robert Rollo Gillespie, with a large force, attacked the Khalanga –Nalapani fort defended by Balbhadra Singh Thapa and his soldiers barely 600 in number.The gallant General,who is said to have been among the bravest soldiers of the British army, fell to the bullets of the defenders. Colonel Mawby succeeded to the command and the attack was resumed on November 25 and the fort was shelled on November 27.The British also cut off the water supply to the fort. All this forced Balbhadra Singh to decide that the fort could no longer be held. On November30, he, along with 70 of his men, evacuated Khalanga. They opened the gate, came out of the fort and ran towards a stream nearby. The British troop was surprised to see this. After they had quenched their thirst, the brave Balbhadra said to the Britishers: "Go and occupy the fort. We have deserted it". When the British troops entered the fort they found nothing but corpses, some dying men and children crying out “Pani,Pani” in their thirst. The Nepalese troops went away, but did not surrender before the British troops. A Mela is held in the last week of November every year in the area to commemorate the sacrifice made by the Gorkhas during the battle. Balbhadra Singh Thapa was killed by Afghan troops when he was later in the army of Maharaja Ranjeet Singh. The foundation of the fort, which was razed to the ground by the British, can be seen under the thick carpet of grass on the hill and also some huge black boulders which were once part of the fort’s walls. The incredible silence tells the story of the exceptional courage of the Gorkha men ,women and children who refused to bow down before the massive British army. Downhill, the original memorial of the war which was built by the British is now an enclosed space with some signages put up by the ASI. There are twin obelisks which stand there - one is in memory of Major General Gillispie and his officers and men , and the other, probably the only one of its kind in the world, was dedicated by the British to the memory of the very men they defeated- Balbhadra and his Gorkhas. People the world over would also like to know more about the brave Gorkhas ,who with their Khukris and their battle cry of “Ayo Gorkhali”, faced the huge British force at Khalanga with exceptional valour. Developing a Gorkha Tourist Circuit in the Doon valley would indeed be a great idea to boost historical and cultural tourism.